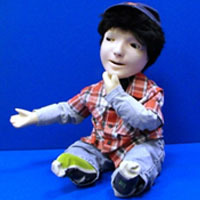 The AuRoRA Project - "KASPAR"
Kaspar is a child-sized humanoid robot developed by the Adaptive Systems Research Group at the University of Hertfordshire. The first version was built in 2005. 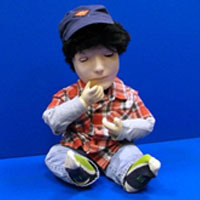 The robot has been used in different projects on developmental and cognitive robotics. However, very encouraging results have been obtained in research that focuses on its use in robot-assisted therapy for children with autism in a series of case studies with dozens of children. 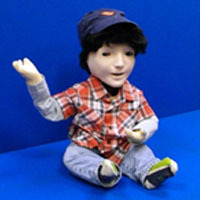 Ben Robins has explored the role of the robot as a social mediator encouraging interaction with other children and adults and developed the mechanism for the robot to be used at the hand of therapists and/or teachers. 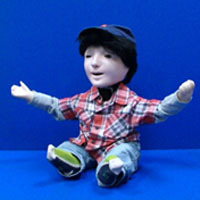 The robot has also used in several studies trying to encourage collaboration among children with autism as part of Josh Wainer’s PhD research (A demo video can be seen here). As part of the IROMEC project Ben Robins and Ester Ferrari studies play scenarios of children with autism and KASPAR. 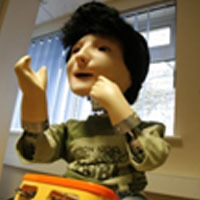 In the FP7 European project ROBOSKIN (2009-2012) Ben Robins has used KASPAR to helped develop cognitive mechanisms that use tactile feedback to improve human-robot interaction capabilities in the application domain of robot assisted play for children with autism. Sandra Costa has used KASPAR to teach children with autism about body parts (Costa etal 2013)).as part of a collaboration with University of Minho, Portugal. Recently, Luke Wood has used KASPAR in robot-mediated interviews for neurotypical children (Wood etal. 2013, a research direction towards using robots as interviewers to be used by social services or police. The latest work of KASPAR and Children with autism can be seen here. KASPAR has 8 degrees of freedom in the head and neck , 6 in the arms and hands and 1 in the torso.. The face is a silicon-rubber mask, which is supported on an aluminium frame. 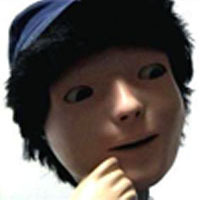 It has 2 DOF eyes fitted with video cameras, and a mouth capable of opening and smiling.